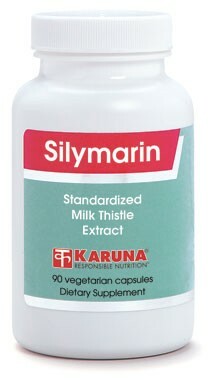 This flavonoid mixture extracted from milk thistle (Silybum marianum) seeds is referred to as Silymarin and has received some of the most extensive research of any phytomedicinal extract. These flavonoids have a strong affinity for the liver, where they exert a number of useful actions. By acting as antioxidants, increasing intrahepatic glutathione levels and blocking entry of toxins into liver cells, they protect the liver from free radical and other damage. Supporting the liver's resistance to the harmful effects of alcohol, drugs and other pollutants is another property demonstrated by Silymarin. Silymarin interacts with hepatic cell membranes, thereby blocking binding sites and inhibiting the uptake of toxins such as carbon tetrachloride, alcohol and pollutants (Phytother Res 2010;24:1423-32). 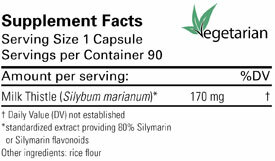 Silymarin supports the liver's resistance to the potentially damaging effects of alcohol, drugs, toxic chemicals, and other substances (Forsch Komplementmed 2008;15:9-20). Suggested use for adults: One capsule three times daily,or as directed.